The 2019 $0 down, VA home loan limit for New Castle County is $484,350. The northernmost of Delaware’s three counties, New Castle County has a population of 538,479. Bordering Philadelphia, and directly across the bay from New Jersey, the county with an area of 494 square miles makes up the majority of Northern Delaware. New Castle County has the greatest population and population density of the three state counties, despite being the smallest by area. The county is the most economically developed in the state, largely because of the presence of Wilmington, the county seat and largest city in the state. Wilmington is a national center for the credit card industry. The passenger train station in downtown Wilmington is largely responsible for the financial status of the county. This station sees an excess of 660,000 people pass through it yearly. Wilmington is considered the entertainment hub of the state. Because of its diverse ethnic population, numerous ethnic festivals are held throughout the year, notably the Italian, Greek, African and Polish festivals. Additionally, multiple musical festivals also occur, popular among them are the Clifford Brown Jazz Festival, Peoples’ Festival (A tribute to Bob Marley) and the Riverfront Blues Festival. Other noted cities in the county are New Castle, Newark, and Delaware City. The town of Middletown was the filming site for the 1989 Robin Williams film Dead Poets Society. The county was founded in 1637 and was the site of the only Revolutionary War engagement in Delaware. 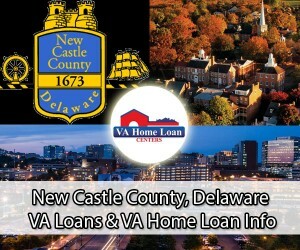 Apply for a VA housing loan in New Castle County by following this link! 35,284 veterans call New Castle County home. This populous is served by the Wilmington Regional Benefit Office. The office administers a range of VA benefits to more than 800,000 veterans and their families in the New Castle County, South Jersey, and Eastern Pennsylvania area. Services include compensation and pension administration, call center availability, guaranteed loans, and occupational rehabilitation. Additionally, Wilmington also has the Wilmington Vet Center.